With multiple flavors that include a hatchback and the high-strung Evo, the Lancer lineup is among the sportiest in the small-car segment. The 2013 mitsubishi lancer electric vehicle qualifies for a federal tax credit of up to $7,500, effectively reducing the net base price. The extensive line of 2013 Mitsubishi Lancer sedans, Evolution rally cars and Sportback hatch/ wagons is collectively the sportiest in the profoundly competitive compact-car segment. There are turbochargers, all-wheel drive (AWD), innovative transmissions and stiff suspensions up and down the line. While there are plenty of more-fuel-efficient choices in the category, and others that offer more features at a lower price, few can match the vibrant driving experience and something-for-everyone model range provided by the Lancer. From the basic DE sedan to the versatile 5-door Sportback and the high-performance Evolution variants, the Mitsubishi Lancer is an enticing proposition for compact-car shoppers searching for something practical that also looks and moves and feels like a sports car. If you're looking for a sleek, sharp-handling compact car with personality and a comprehensive warranty, you'll find the many Mitsubishi Lancers worth a look. If you want your morning commute to feel like an Acropolis Rally special stage, the Evo is your ride. While the Lancer's sub-$17,000 starting price is attractive, value-driven buyers may favor the equally priced Hyundai Elantra and Kia Rio for their additional standard features and superior fuel economy. The only changes to the 2013 Mitsubishi Lancer line are a few additions to the all-wheel-drive SE model, including Thule plug-in roof-carrier accommodation, new-design 16-inch alloy wheels and an available Premium Package with sunroof, Rockford Fosgate audio system and leather-wrapped steering wheel and shift lever. With horsepower ratings that range from 148 to 291, engine choice obviously has a huge impact on the Lancer driving experience. Still, the whole line shows an appreciation for response, balance and involving the driver. A mid-range GT model we tested impressed us with its composure on twisting mountain roads, and with its tenacious grip on the pavement. And a slightly smoother and quieter ES seemed very well suited to daily around-town driving chores, though it still talked to us about the road surface and what the tires were doing. These are all sporting automobiles. Some extremely so. In Evolution guise, the 2013 Mitsubishi Lancer is as stiff, loud, raucous and fast as some real race cars. It's loads of fun but not everyone's idea of everyday transportation. Be sure you know what you're getting into. The Lancer's hard-drive-based navigation system responds more quickly than traditional DVD-based units. It also features Mitsubishi's new FUSE voice-recognition software for simple multimedia commands. In Mitsubishi's parlance, it's a TC-SST, that alphabet soup standing for Twin-Clutch Sportronic Shift Transmission. To us it's just an excellent automatic (with manual-shift mode) that rifles through gears faster than we ever could. 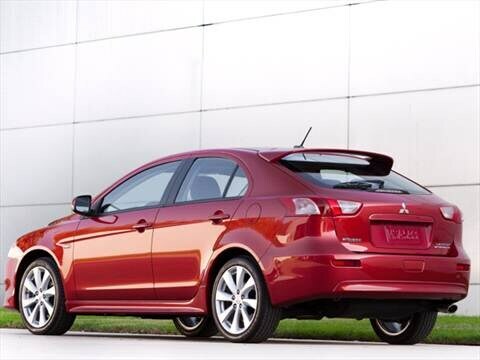 The 2013 Mitsubishi Lancer's aggressive and modern exterior styling, sadly, does not extend into the cabin. The interior design looks a little stale and there's too much hard, cheap plastic. The steering wheel does not telescope and most of the seats have no height adjustability, so many drivers will have to adjust to the Lancer driving position rather than vice versa. The GT and Ralliart trims feature the most appealing interior, with a leather-wrapped steering wheel and shift knob and deeply bolstered front seats. The Sportback's flexible configuration delivers an impressive 52.7 cubic feet of cargo space. The 2013 Mitsubishi Lancer separates itself from the mundane designs of traditional compact cars with its bold stance, aggressive snout and general attitude inspired by rally cars. Mitsubishi says the massive front grille suggests the air intakes found on high-tech fighter jets. The base DE model rolls on 16-inch steel wheels while the rest get alloys, 16-inch on ES and SE, 18-inch on GT, Ralliart and Evo. The Evo models have a gaping, black-mesh front grille, heat-extractor vents on the side, twin tailpipes in back and either a subtle rear spoiler (MR) or outrageous wing (GSR). The base DE trim is pretty short on creature comforts so we'd start looking at the ES, which adds air conditioning, power door locks, steering-wheel-mounted controls, an auxiliary audio input jack and remote keyless entry. The SE model adds all-wheel drive, a more powerful 2.4-liter engine and heated seats. GT models have 18-inch alloy wheels, a sport-tuned suspension, automatic climate control, FUSE voice-recognition software with Bluetooth and sport seats. The Ralliart boasts a 237-horsepower turbocharged engine, AWD and a 6-speed twin-clutch Sportronic automatic transmission. The high-performance Evolution features a 291-horsepower turbocharged engine with AWD and large Brembo brakes. Some of the Lancer's most desirable options are a 40GB hard-drive navigation system and the Deluxe Package that includes FAST Key keyless entry and start, Sirius/XM satellite radio (with three months of service), FUSE voice-recognition and a sunroof. An audio upgrade is available, an awesome 710-watt Rockford Fosgate system with a 10-inch trunk-mounted subwoofer and USB port. A Continuously Variable Transmission (CVT) serves as the automatic transmission option for the workaday Lancers (with paddle shifters in the GT), while the Ralliart and Evolution offer an excellent 6-speed twin-clutch Sportronic Shift automatic (TC-SST). Much variety here: The 2013 Mitsubishi Lancer sedan in base DE trim gets a 148-horsepower 2.0 and 5-speed manual gearbox. At the ES level the same engine is paired with either the manual or an automatic CVT (continuously variable transmission). Move up to GT and it's a 168-horsepower 2.4, with manual or CVT. The SE trim uses the 2.4 and offers only the CVT, but with AWD. The Ralliart gets a 237-horsepower 2.0 turbo-4 with a 6-speed twin-clutch Sportronic automated manual transmission and AWD. The racy Evo models have 291 turbocharged horses and either the 5-speed manual (GSR) or 6-speed Sportronic Shift (MR), both with AWD. The Sportback comes in ES trim (with the 2.0) or GT (2.4), with the CVT and front-drive only. The base 2013 Lancer DE carries a Manufacturer's Suggested Retail Price (MSRP) of $16,790, while the ES starts at $17,890. The CVT automatic adds about $900. SE and GT models start around $21,000 and can top $29,000 fully loaded. The Ralliart trim starts just under $29,000 with the Evolution coming in around $36,000 (GSR) or $39,000 (MR). The Lancer Sportback hatch adds a $500 premium over the ES or GT sedan. To see what people are paying for Lancers, check out our Fair Purchase Price. It's worth noting that the well-appointed Hyundai Elantra and Kia Forte also start around $16,000 while the Honda Civic and Mazda Mazda3 start closer to $17,000. On the resale side, we do not expect the Lancer to retain its value as well as the exceptionally resilient Civic or the Mazda3. I love my car. It runs so good (knock on wood). I’ve never had any major problems with it. Awesome Performance. Excellent on Fuel. Love the performance and excellent on gas. Very comfortable seating and plenty of leg room. Simply a reliable car.